These Crockpot Mashed Potatoes are one of our most popular recipes (originally posted November 11, 2015), so I’ve updated it to include a how-to video! Enjoy! If you love this crockpot thanksgiving wonder, you’ll also love: slow cooker corn pudding, slow cooker mac and cheese, and crockpot vegetarian stuffing! Remember yesterday when I told you guys that Thanksgiving food, to me, means carbs? I changed my mind. 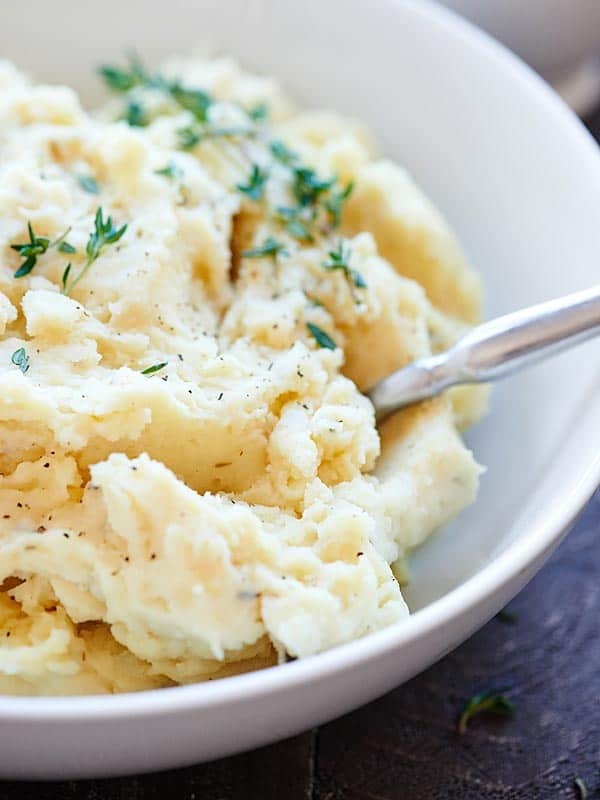 Thanksgiving, to me, now means stuffing my face with this Crockpot Mashed Potatoes Recipe. I would like to think of myself as a potato connoisseur. I’ve certainly eaten enough potatoes. Mash ’em. Bake ’em. Fry ’em. While I do love all potato preparations equally, mashed might slowly be taking the lead. It has spices like rosemary and thyme which screeeeeam cozy and delicious. 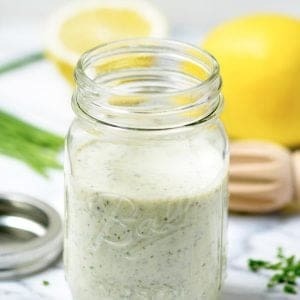 It contains ingredients like butter, cream cheese, parmesan, and sour cream. I love that there are only 3 steps to this recipe. Can potatoes be cooked in a slow cooker? Yes! Potatoes can be cooked in a slow cooker. I get this questions all the time. Other than making mashed potatoes in the instant pot, crockpot mashed potatoes is my FAVORITE way to make potatoes. All you need to do is peel and cube potatoes, add in a few more ingredients (listed below), then you’ll cover and cook on LOW for 7-8 hours or HIGH for 3-4. Throw everything into your crockpot: peeled and cut potatoes, broth, garlic, salt, pepper, rosemary, thyme, and butter. Cook for a few hours. This is one of those amazing recipes that you can throw the ingredients in and then forget about them until it’s done cooking. Throw more ingredients in: cream cheese, parmesan cheese, sour cream (aka the trifecta of thanksgiving yums), whisk using a hand mixer, and d.e.v.o.u.r. 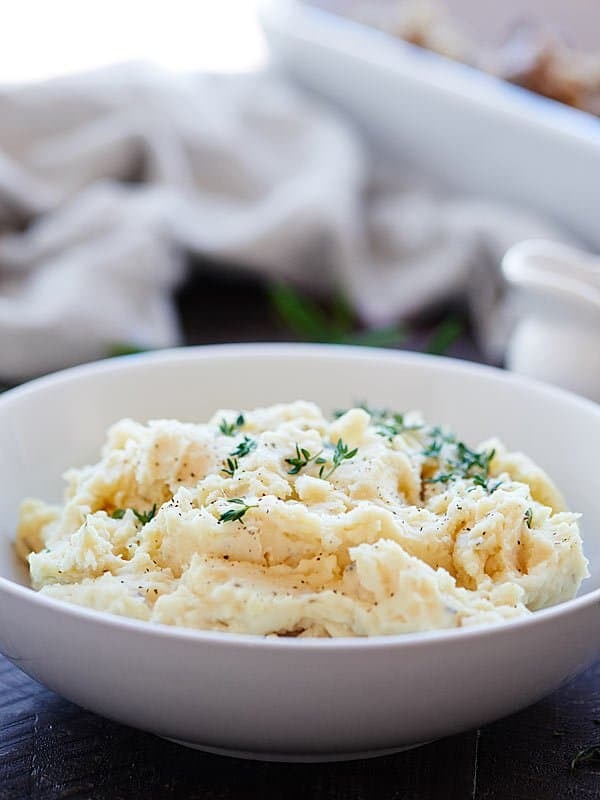 I just love how easy this crockpot mashed potatoes recipe is and BONUS did you catch that I used a hand mixer to mix these together right in the crockpot?! This is a one pot wonder and you know how much I love those. PLUS, that means these potatoes are perfect for Thanksgiving when you already have a bajillion other dirty dishes. Now, I prefer these crockpot mashed potatoes ultra creamy and smooth, so I mix these a little longer. Trevor, on the other hand, prefers these a little chunkier, so the choice is yours! These are truly great smooth or chunky. One tip: while I do enjoy really smooth mashed potatoes, don’t over mix them! Over mixing your potatoes can make them really sticky and gross. Can I make my crockpot mashed potatoes recipe ahead of time? What is the best way to reheat mashed potatoes? Yes! 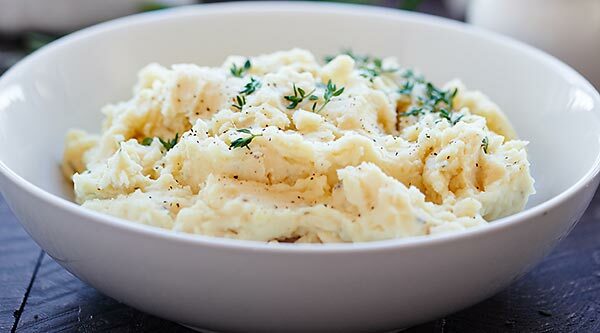 You can absolutely make mashed potatoes ahead of time, about 2 days ahead of time. 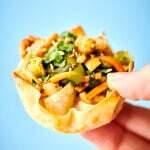 Make them as directed, store them in the fridge, then reheat in your crockpot! I’m guessing 2-4 hours on low will reheat these perfectly! 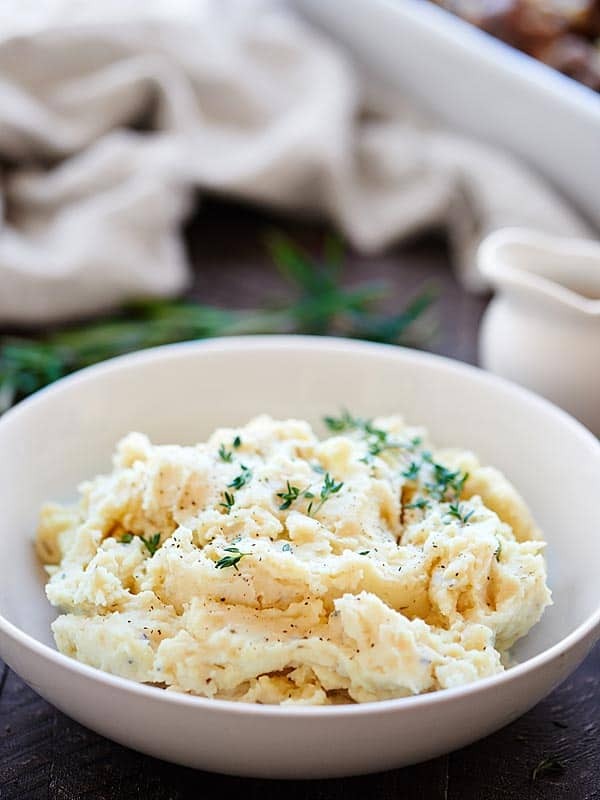 These crockpot mashed potatoes will definitely make the perfect addition to your Thanksgiving meal! They’re so creamy and buttery. I absolutely love the addition of rosemary and thyme. And really…you can’t go wrong when cream cheese, parmesan, AND sour cream are involved. Smooth mashed potatoes or chunky potatoes? Show me the yummy! Need more holiday recipes? Be sure to check out all our Easy Thanksgiving Recipes! Cover and cook on LOW for 7-8 hours or HIGH for 3-4, or until the potatoes are tender. Once the potatoes are done, stir in cream cheese, parmesan, and sour cream. Use a hand mixer to blend potatoes until desired texture has been reached! I love this recipe and going to make it Thanksgiving for sure! 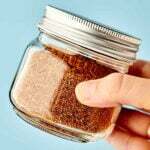 Do you usr ground or crushed rosemary and thyme? This recipe looks great and I plan on making it for Thanksgiving. 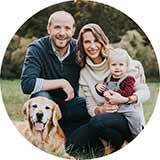 In your experience, how many people do you find the above proportions account for? Hi Chris! Thank you so much! I’d say it serves 6-8 🙂 Enjoy! Hi Jennifer, Did not want you to think that I forgot about You. The Crock pot Mashed Potatoes turned out Yummy using Russet Potatoes. I have made twice & will keep making them. Are there really 980 calories per serving??? Hi! How long do you think these would keep in the crockpot? Would they still be good if I made them 3 hours in advance? Hi Dee! Yes! 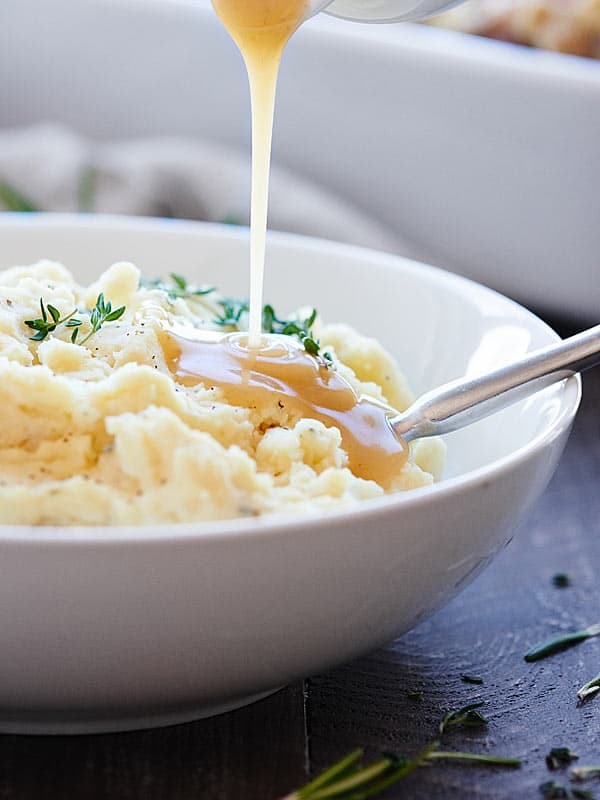 Here’s a great article on the best way to freeze & reheat the mashed potatoes. 🙂 I hope that helps! Enjoy! Do you need to drain the potatoes before putting in the cream cheese etc? Hi Danielle! Nope! Nothing gets drained 🙂 I hope you love them! Does the cooking time need to be increased if doubling or tripling this for a larger crowd? You MIGHT need an additional 1 hour on HIGH or 2 on LOW. How would it be if I hand mashed or riced the cooked potatoes before or after adding the final ingredients? I know it’s more work but thinking I could get all lumps out without over beating using a mixer. It could still be done earlier Thanksgiving Day leaving 2 or less hours on warm. Thoughts? I love crockpot recipes for the holidays! The oven is always so stuffed. 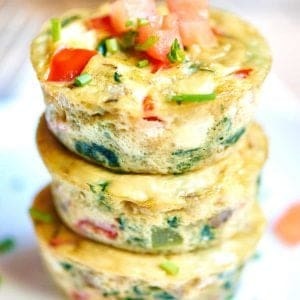 These look so delicious and so easy. These mashed potatoes sound perfectly luxurious! Love the addition of cream cheese to the recipe, such a great way to improve this delicious holiday staple! LOVING the look of these. One of my fav comfort foods. Love recipe! 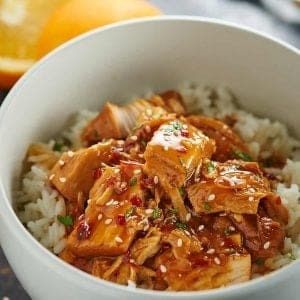 Could you make day ahead and warm in crock pot next day? How would you adjust warming time? Thank you! Thanks Mary! Absolutely! I’d just keep it on the “warm” (not high or low) setting. I’m guessing it 2 hours would be fine? My husband and I loved the taste of these potatoes. May be a stupid question but would these still turn out if you were to just mash and not beat? I didn’t like the gooey texture (I tried to not over beat but also didn’t want lumps). I prefer them mashed but they are still on the soft side probably because of the cream cheese. If you really want a firm potato I suggest cooking them a day ahead of time and refrigerating over night – this is what I do before serving to the people that prefer theirs firm. Lol. Bummer! I’d just boil the potatoes in the broth separately and then stir all the other ingredients in (minus the broth now). Hope that helps and I hope your new crockpot is great! Do you think this recipe would work if I left the skin on the potatoes? I followed the recipe and it turned into a tasty soup. What went wrong? I am going to try to add more potatoes and try to thicken it. Are you positive you used 4 pounds of yukon gold potatoes and 2 cups of broth? You could have also over mixed the potatoes! We’ll make a note of that. Thanks Larry! Can this recipe be cut in half? If so do I need to change crockpot cooking time? Hi Juanette! This recipe can definitely be halved. 🙂 I’d still stick with the listed cook time, but I can’t completely say, because I haven’t personally tested it. These are absolutely delicious! This will now be my go to recipe for mashed potatoes!! Everyone loved them. And not having to mash potatoes at the last minute was wonderful! That’s awesome! Thanks so much Janisse! I’m not a sour cream fan. Suggestions for leaving it out? Just omit, use greek yogurt, or just more cream cheese! I’m not a sour cream fan. Do you have any suggestions for leaving it out?